North Korea rarely has much to show off. Every 20 years or so, they upgrade to a new Kim, and the product rollout is pretty much the crazy, hermit-state equivalent of the iPad 3 launch. This week, however, Pyongyang had a whole different kind of launch in mind and took the unheard of step of polishing up the Dear Leader statues and throwing open the doors to the international press, as the country attempted its first satellite launch. It was a dud. According to U.S. and Japanese defense officials, a rocket fired from North Korea early Friday failed mid-flight, breaking up in the atmosphere. But just the idea of North Korea aiming for space  and having the missile muscle to get there  led to hair-on-fire panic in east Asia and a more measured but very real angst in the rest of the world. A loonytoons country with nuclear weapons and global reach is no one's idea of a good thing. The key questions  still unanswerable  are whether North Korea may soon have the technical chops to reach orbit and if they do, does that mean anything? This much we do know: the rocket Pyongyang fired had the size and thrust profile to loft a payload into space. It's the 104-ft. (32 m), three-stage Unha-3 booster, powered by liquid-fueled engines  the motor of choice for manned launches and major satellites, as opposed to the solid-fuel kind, which power most U.S. long range missiles. No one doubts that the Unha-3 can fly fast and fly high, the question, which proved critical on Friday, is one of degree. Attaining orbit requires reaching a speed of 17,500 mph (28,000 k/h), or about Mach 25. An intercontinental ballistic missile (ICBM) gets to about Mach 20; short-range missiles top out at just over Mach 6. An orbit that's stable and sustainable requires you to climb to an altitude of about 120 mi. (190 km)  and even that would decay quickly due to drag from the wisps of air in the upper atmosphere. Sophisticated on-board guidance system are a must if you're aiming for an orbit with a particular inclination, which is necessary when, say, a shuttle is trying to link up with the International Space Station and is working with margins of error measured in inches. But for other kinds of missions, a sloppy, toss-it-anywhere orbit is an option too. "In our early satellites, the guidance was basically transmission from the ground rather than something in the vehicle," says John Logsdon, former director of the George Washington University Space Policy Institute, "You need better guidance to get to a precise orbit, but an orbit that's approximate is easier." Approximate, by all accounts, would have been plenty good for North Korea, since the satellite they showed off to reporters  a 1,000 kg (2,200 lb.) cube covered with solar panels and topped by a high-definition camera  was barely above the hobbyist level compared to the hardware other spacefaring nations loft. That alone suggests that the mere fact of joining the space club is what this entire exercise was about. "If North Korea is successful, it would put them in a small set of perhaps eleven countries," Logsdon said before the launch. "And they'd one-up their neighbors to the south, who have failed twice to put a satellite up. I'd say that's one of the reasons they're inviting press in." Adds space expert John Pike, director of GlobalSecurity.org: "Apart from North Korea getting on TV and strutting their stuff, this doesn't mean much." The North Koreans didn't face the global embarrassment of their booster simply blowing up on the pad  something the U.S. learned painfully when it attempted to launch its first satellite on Dec. 6, 1957, only to have the rocket climb barely six inches before it ate itself in a massive fireball. But reports that the rocket broke up mid-flight suggest that while the Unha-3 cleared the pad and made it into blue sky, it failed to reach space, overcome by vibrational and atmospheric forces. "The challenge," says Logsdon, "is controlling the propulsion so that the rocket is able to reach Mach 25 without breaking up." For people rooting against the rocket's success  which was pretty much everyone in the world who doesn't live in North Korea  failure during the ascent stage was the great hope. And with good reason. The physical forces trying to keep a rocket from climbing are vastly more powerful than those trying to push it up  with gravity, atmospheric friction and vibration the three most likely to lead to disaster. Gravity is actually the easiest to overcome, if only because every second you fly is another second of fuel that burns off, and that makes you lighter. The less a rocket weights, the more easily it climbs and reaches orbital speed. We don't know much about the Unha-3's engines, but you would probably get at least even money if you bet that they don't burn fuel efficiently and fast. Air resistance has something to say about all this too, pushing down on a rocket at the same time gravity pulls on it. An aerodynamic design can minimize this, but that involves more than making a rocket pointy. If it's not flat-out slippery  down to the last rivet and seam being smoothed away  you may experience too much drag and generate too much frictional heat to survive. That requires sophisticated materials, engineering, milling and manufacturing  something the hermit state has not necessarily proven itself capable of managing. Then there's deadly variable of vibration. Rocket engines are nothing but controlled explosions, and if you have more than one engine in any one stage  which most space-bound missiles do  you've got to coordinate the vibrations so that they dampen, rather than amplify, one another rather. Plenty of American and old Soviet rockets were shaken to bits on ascent, and the betting in the space community tonight is probably that that's what did the Unha-3 in. But even failed launches can be a learning experience. And if the Unha-3 ever proves its mettle, the international security issue becomes very real. Even a primitive satellite like the one the North tried to launch can, in theory, make a nuisance of itself in space. "A satellite in orbit can be used to interfere with other satellites," says Henry Hertzfeld, professor of space policy and international affairs at George Washington University. "The question is not so much the capability as the intent." Scarier still is the idea of an Unha-3 that never even aims for space, but is instead repurposed as a long-range missile. Military analysts accept that the North could easily manage a lob shot into South Korea, Japan or the Asian land mass, or even a deep fly-ball to the west coast of the U.S. And as for the guidance? That's not a problem if you're not picky about where you land. "North Korea doesn't care about accuracy," Pike says. "L.A. is pretty big and it's the thought that counts." Still, the greater the distance, the safer a potential target, since ICBM's and even medium-range missiles must fly above the atmosphere for at least part of their trajectory, and reentering generates a lot of heat  up to 3,600 F (2,000 C). The U.S. has been building heat shields since the 1950s and has become very adept at it. North Korea has nowhere near as much experience. "The heat shield you need for an ICBM is more complex than the one you'd need for a shorter range missile," says Pike. That means that a reentering warhead could simply incinerate like a meteor before it ever does its intended damage. Pike, however, also points out that if the North Koreans were really bent on hitting the continental U.S., they probably wouldn't use a missile as big as the Unha-3 anyway, since American intelligence and satellite surveillance would surely spot it long before it left the pad. A better, scarier scenarios would be to mount a weapon on a more modest booster like the one- and two-stage Taepodong series and fire it from a small ship at sea. Those possibilities are just the kinds of thing Defense Department war gamers stay up nights thinking about, so there's reason to assume  or at least hope  they have plans in place to deal with such an eventuality. North Korea's latest launch may have failed, but there is plenty of cause to worry about the next time. 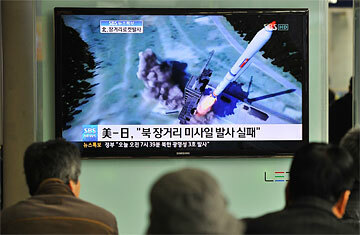 MORE: North Korea: Launch or Lunch?